At Marquis Precision Engineering we have both Conventional and Sliding Head turning facilities. These services are carried out on our automated lathes. Traditionally lathes have been used to turn everything from wood to metal and plastics. We use ours to create large and small components out of plastic, metals like copper, metal alloys, ferrous and non-ferrous metal including acetal, stainless steel, Kovar, Invar and aluminium. At Marquis Precision Engineering all our CNC Turning machines are capable of Y Axis Milling as well. All but one of our machines have a sub-spindle and all our lathes have live tooling. This means that we can easily and affordably create components which are both turned and milled. 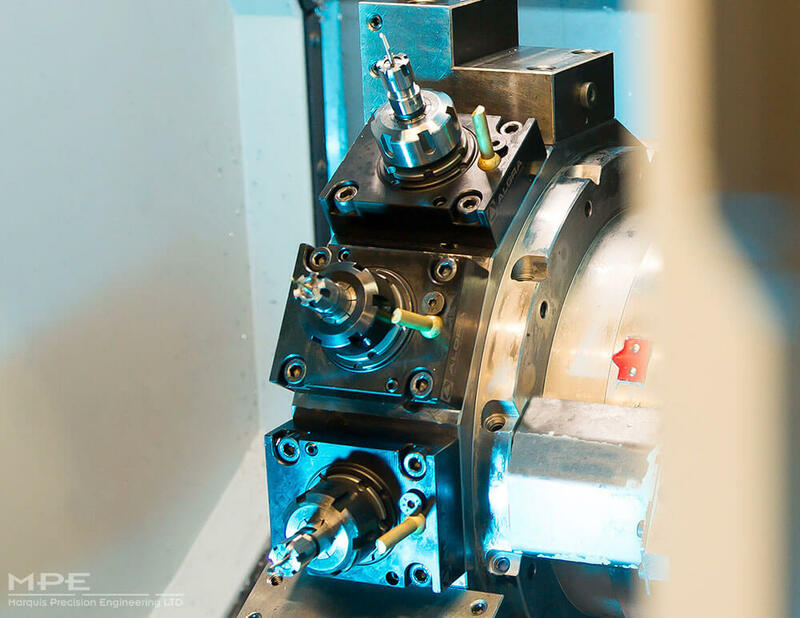 Whereas before, separate CNC Milling and Turning machines would have had to be set up, our automated lathes can undertake both processes in one. This reduces set-up times and costs. Conventional Turning is where a material is clamped into the machine and the material turns against the cutting tools to create the component. In Sliding Head Turning the material is pushed past the tools to create the component. This is especially good for creating long, thin components, which can be made from one continuous piece of metal. Inspections are done manually by our highly-skilled workforce, who check throughout the process that the components are uniformly conforming to the design brief from the client. In CNC Milling this process is automatic. Did you know that CNC stands for Computer Numerical Control? The computer in the Turning tools takes the information from the CAD graphic (Computer Aided Design) and turns it into a numerical code or ‘language.’ This then acts as a guide for the machine to make the component. All our machines at Marquis Precision Engineering speak the same ‘language.’ This means that, if for any reason, one machine goes offline for maintenance or breaks down, we can easily programme another machine to take over its workload. This ensures we can move the workload around our production line and react quickly to anything that occurs. This means we can always provide the highest reliability. Our customers know that if they need a component we will deliver – on time, to the highest quality standards and at a competitive price.